Superego is different from other time trackers in that it never tell anyone what you're doing. There is no magic server or database somewhere, no "phone home", no "adaptive device support", no key logger, no information leaking. Superego is a fully sandboxed application and cannot track what you're writing. Heck, it cannot even make a network call. Your data is yours. No one but you can track yourself. Start it and it will start tracking your application usage. Feel free to quit the application window and use the status menu (the one with the clenched fist) to control the app. You can also reopen the main application window from there. You can always start and stop the data grabbing with the menu (or the main window) when you're doing things you don't want to track (or it's a time you don't want to track). Application and documents can be linked in "Lists". A list links applications and document for easier classification. For example you can compile a list of all documents open in Safari (pages, in this case) that have "twitter" in the name and any document open in Twitterrific for Mac and on the native Mac twitter client to track all the time you spent (or may be waste?) on twitter. Similarly you could track time really spent on your projects just by creating a list with the related applications documents. Lists can be exported and imported and shared between users and computers. The Edit button will start the list editing. Import and export are, well, import and export. Simply point to the right file after selecting it. Delete does what it says. Beware that there is no undo! Add and edit with respectively add a new list or edit the selected one. 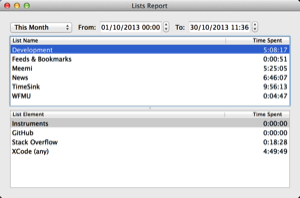 On the List Editor you'll see the list of Elements the list will use. An Element is basically an application and a document pattern for the application. In other words, say: Microsoft Word and all the documents containing the words "free thought". A blank doc pattern means: all the documents opened in this application. Adding an element will start the 'add element' box. Name is the name of the element (it is descriptive only, use anything you'll remember). Bundle ID is the bundle id of the application. In other words, the application identifier. Don't worry, it will be easy to find it. Document pattern is a list of words that have to be present in the document title. If blank means: any document. The "matching documents" table will show all the documents matching the bundle id and the patter. At the very start because both bundle id and doc pattern are empty, all the document the superego knows about are shown. 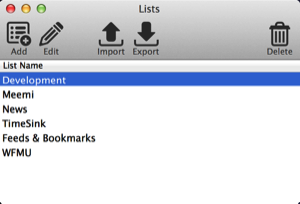 To easily start double click on a relevant document in the list to "init" the element. Let's say you want to make a list element matching any New York Times page (so to understand how much time you read the New Your Times online). Before starting the editing you have to open one or more pages from the NYT in your browser (I am assuming safari, here). Scroll the "Matching Documents" table to find a New York Times page and double click on it. The Bundle ID and the document pattern will be autoloaded with the Safari bundle ID (that's com.apple.Safari) and the page title. The Matching documents will show only the just selected title. Now cancel the words from the Document Pattern until the bare minimum to identify the site will remain. 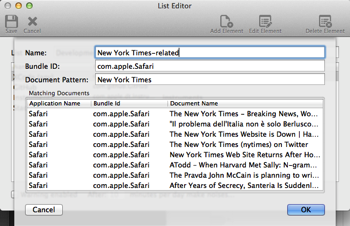 In this case leave only NYTimes in the document pattern field. The "Matching Document" table will show all the pages you read in the NYT. 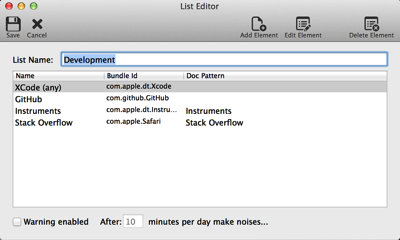 To make the same for Pages' document, just select a Pages document from the list on a new element list, the bundle ID will be, in this case, com.apple.iWork.Pages. Filter the document via the document patterns to match what you are looking to track. You can find some exported lists here for you to study and/or modify. To import simply download them and use the "import" button in the Lists Window to add them to your list or double click on it from your download location, the list will be automatically loaded. Reporting is available via both "application report" (based on the applications, independently from lists) and via the "Lists report" (that will show the list and the list elements). Both reports are configurable in time frame to be shown. On the Lists Report, you can double click on each "list Element" to show the documents that matched that list element (useful also for debugging the lists). Currently there is no way to export the data for further analysis, but the option will be added as soon as possible. Get the application for free on the Mac App Store. It will remain free forever with the current feature set. Additional features could be added in the future as in-app purchases for power-users. The application requires OS X version 10.7 or later on a 64-bit intel Mac (any mac built after 2007 will do) and it's fully compatible with Mavericks.